1. Unless you are preparing a recipe that specifically calls for green mangoes do not buy mangoes that are too hard/’green’. They will not ripen properly. Choose mangoes that yield to gentle pressure and use your nose: a ripe mango will have a very fragrant aroma and unripe mango will have none. Coloration doesn’t matter (some mangoes naturally keep a green skin), also if the flesh is relatively firm, don’t worry about a few small spots/blemishes. 4. If you are unable to find sufficiently ripe/flavourful mangoes in your area, substitute peaches or nectarines. 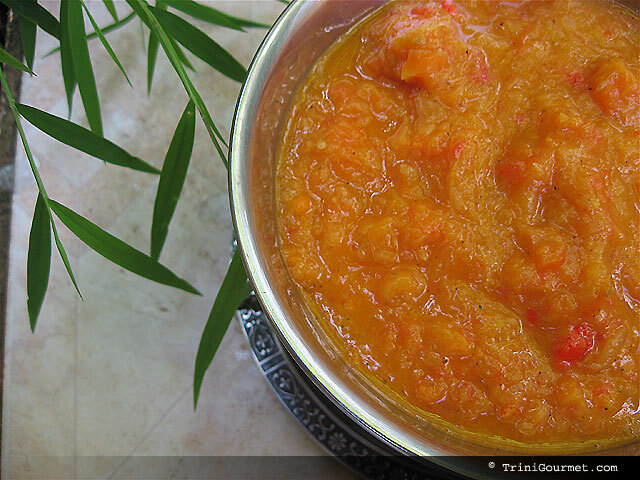 The richness of flavour is what is important in any mango recipe (especially desserts) and underripe/flavourless mangoes are not worth your time. 5. 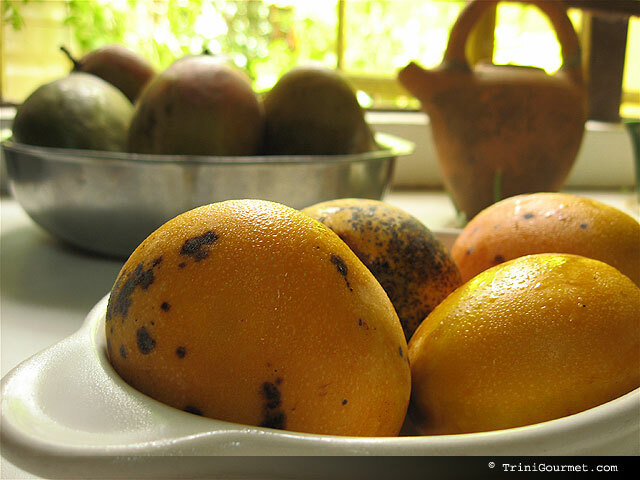 Store mangoes at room temperature and out of the sun, until ripened. The ideal storage temperature for mangoes is 55 degrees F. When stored properly a mango should have a shelf life of 1 to 2 weeks. 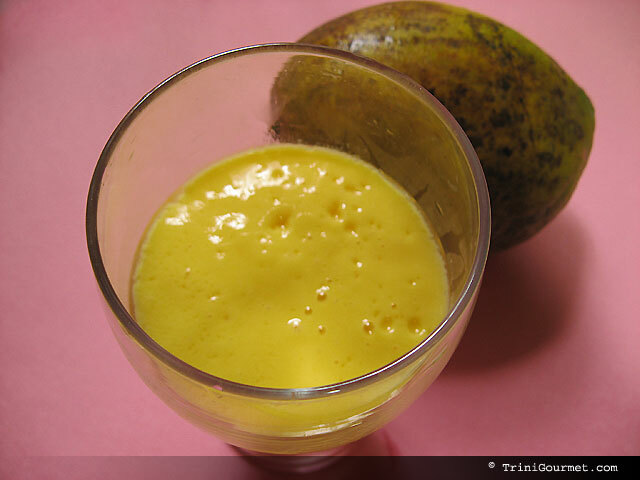 While the mango will not ripen in the refrigerator, it can be kept chilled there once ripe. 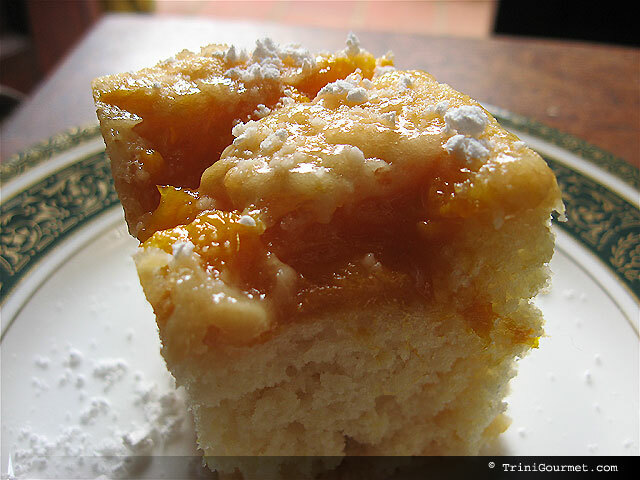 This mango cake is very light and elegant in appearance, especially when topped with a dash of icing sugar. The batter is topped with brown sugar and butter which crystallizes to form a delicate stresuel topping and the slivers of ripe mango settles themselves throughout the batter forming succulent counterpoints of sweetness. This rich cool, slightly tart, beverage is the perfect complement to spicy, fiery cuisines and is also hearty (and healthy) enough to be a satisfying shake all on its own. Green mango chow is a wonderful accompaniment to most meals. Light and yet spicy, it adds a tart sweetness when used as a condiment. Icy, tropical and sinfully sweet. Rarely do mangoes get to shine as the main ingredient the way that they do in Allen Susser’s Great Mango Cookbook. Not only does he include descriptions for more than 50 different varieties of the fruit (many of which were not known to me) he also treats this wonderful fruit in both its savoury, as well as sweet forms. 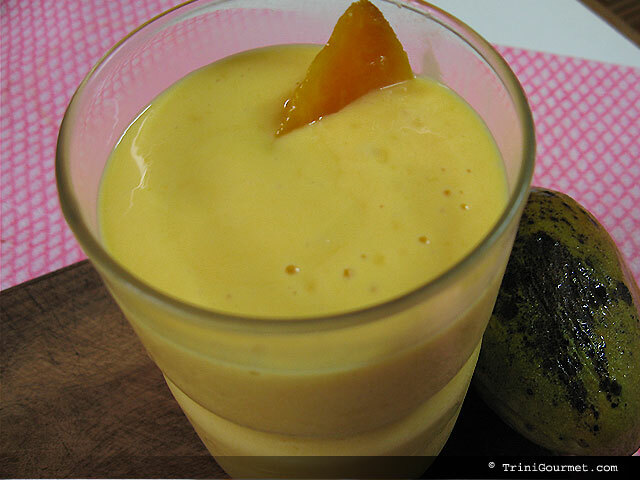 If you’ve been looking for more ways to use mangoes in your everyday life but have drawn a blank after the obligatory smoothies and occasional curry, chutney and chow, this may be what you have been looking for! 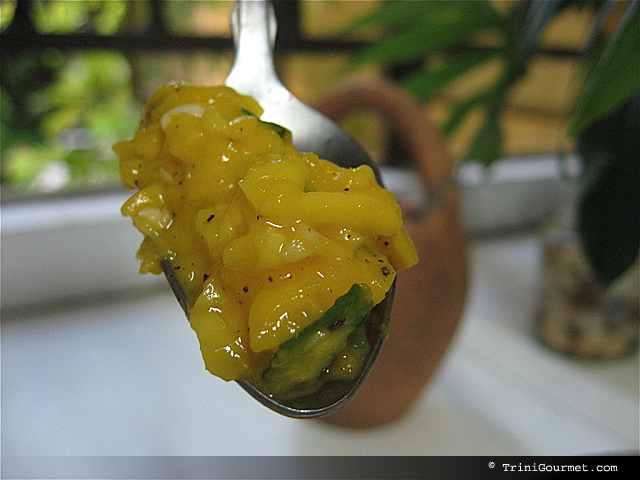 Here in Trinidad curried mango is a regularly enjoyed staple. In Mangoes & Curry Leaves husband and wife team Jeffrey Alford and Naomi Duguid, dig even deeper into the Asian sub-continents preparations of this decadent fruit, as well as many others. It never ceases to amaze me how many ways an ingredient can be re-interpreted by different cultures. One of the many pleasures of cooking for me has been the ability it affords me to get a glimpse into another way of living and to ‘escape’ my four walls, albeit it briefly. Green Mangoes and Lemon Grass approaches mangoes from a distinctly Southeast Asian angle, and leans more towards it’s savoury applications in its green form. This angle is one that is often overlooked on this side of the ocean, so the perspective is much appreciated! As we continue on our tour of the virtual mango ‘globe’ it would be unwise to ignore Latin America. Mongo Mango is more than happy to meet that request, and it stops by a few more regions for good measure! Rounding out my list of hand-picked recommendations, I come full circle with Mango Mia. 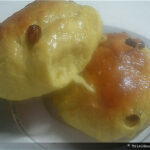 Another gastronomic celebration of mangoes and their myriad applications. This book also focuses on Latin American/Caribbean applications.